1st of October was supposed to be an Independence Day celebration of Nigeria, but unfortunately there was absolutely nothing for the people of Nigeria to celebrate about Nigeria except only evil, poverty, sufferings, looting of government treasuries by government officials, injustices, backwardness, marginalisation, killings of unarmed Biafrans by the government of Nigeria. 1st of October, we went around Onitsha, Anambra State to see things for ourselves, we saw there were no celebration anywhere in Onitsha, Anambra State, and there were no people wearing anything related to Nigerian colours, not even one. October 1, 2017, was not just a day declared to mourn the Biafran people killed by the Nigerian murderous military from September 10th, 2017 to September 17th, 2017, but it was also a very historical day for Biafrans to remember their sacrifices. 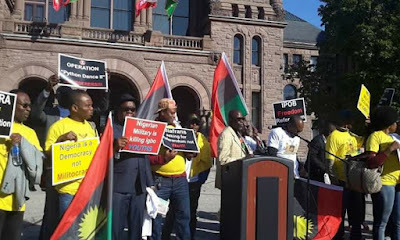 I said it was historical because Biafrans have again shown their commitment and resoluteness towards restoring Biafra and have totally rejected this fraudulent Nigeria by boycotting Nigeria's Independence Day celebration and everything connected to it. It was also historical because on this day Biafrans carried out another massive protest in Biafra land against the full militarization of our land by Nigerian army and the ongoing secret abductions and killings of our people by the Nigerian military in Biafra land. We witnessed the resoluteness and formidability of Biafrans; indeed Biafra is a spirit and unstoppable. You can take a horse to the stream but you can not force the horse to drink water. Destiny can be delayed, but it can never be denied. We are Biafrans, we are NOT Nigerians and Biafra has come to be. A forced unity is not unity at all. So, the Buhari-led federal government of Nigeria or whosoever that is bearing his name should stop wasting his time, energy and scarce resources bribing people, fabricating fake news, and killing innocent unarmed Biafrans just to force us to drop Biafra agitation and come back to Nigeria. It is IMPOSSIBLE for us Biafrans to drop our agitation for Biafra and come back to Nigeria; not after you have killed our people in their millions. It will not work. It is an attempt in futility. Our minds are made up. Our minds and souls belong to Biafra and we have rejected Nigeria totally just as we have once again shown it today. And that is final. Furthermore, our demonstration has once again shown that we are sick and tired of this fantastically corrupt Nigeria. The whole of Biafra land on October 1st was Nigeria free Zone. There was no single human being sighted wearing Nigerian colours and no Biafran celebrated this tyrannical State of Nigeria. How can we celebrate this fraudulent and wicked country called Nigeria that is full of only evil continuously? Celebrating Nigeria's independence means celebrating evil and wickedness of the highest order. Celebrating Nigeria's independence means celebrating the killings of unarmed Biafrans protesters by Nigerian military, it means celebrating crime against humanity, it means celebrating thieves and looters of tax payers money and property, it means celebrating high class injustices. October 1st 2017 remains a very remarkable day in the lives of Biafrans because we have seen that Nigeria is dead and buried. No one is a Nigerian and no one is patriotic about Nigeria. No one celebrated her and no one is willing to celebrate her. We would have wished you Nigeria to rest in pieces, but there is no peace for the wicked. Nigeria is a hellish country with such annoying people. It's time IPOB and Biafra people adopt the strategy of the Ambazonia Southern Cameroons or Catalonia referendum in Spain. It's time to form our own government and declare our freedom and independence from the murderous evil sharia Islamic contraption called Nigeria.